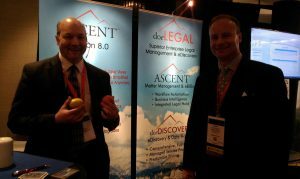 I’ve been attending “Legaltech New York” for a very long time. See, here, here and here for glimpses of my experiences traveling into the Big Apple to walk the walk and meet up with others who talk the talk in legal tech. Last year, the host of LegalTech NY, ALM, made some drastic changes to the event, format and some adjustments to pricing that left most long-time attendees scratching their heads. reap the largest profit this year by having the most people be physically at the event. OK. So what did ALM change in order to advance the objectives outlined above? Confusion No. 1 – How Many Days in a Week? ALM told us that the event was going from a 3 day show to a week long “experience”. Count with me here … the show begins, technically, on Tuesday and runs through Thursday. The Expo Hall runs Tuesday – Thursday. So Tuesday + Wednesday + Thursday = 3 days. What ALM did was add 3 educational “boot camps” (no Expo floor) on the Monday before the show. So, for paid attendees, stuff is happening Monday through Thursday. That’s still only 4 days and call me Louis Black — but 4 days does not equal a week! Confusion No. 2: Let’s Change the Name! Yeah…. that’s a good idea. It really blew my mind last year when ALM changed the name of the event. Now I get it that linking from year to year and the whole SEO of things is as totally lost on large corporations who run events as it is on most law firms. H/T VBA Literati Mark Homer. But, I imagined that ALM would know a wee bit about branding. There is not a legal geek (world-wide) who did not recognize the words “Legal Tech New York” to mean THEIR event which has been bringing people to New York, in the dead of winter, for all things legal and tech for over a decade. Branding 101 – Q1: Does your url/name conjure up an image of you/your brand/event in the mind of your target audience? A. Yes. Then don’t mess with it! ALM decided it was a good idea to toss out the baby with the bath water with regard to branding to the words “legal+tech+new+york” by changing the name of the event to “LegalWeek –the Experience”. But they didn’t make it a week long event, nor did they really make it an “experience”. If I worked at ALM, I already know I’d be the only voice in the room stating the obvious negatives of changing the name above the webby stuff and confusion … like ALIENATING OUR ENTIRE BASE … but then I’d probably be the only girl too so everyone would look at me, smile and nod (like they had ANY clue about what I was saying) and then go right back to dismissing me as “being on the rag” or whatever it is they tell themselves in their heads. Now, I read somewhere their thinking re the name change was to be able to appeal to a wider audience. I get it. Numbers have been falling and they needed to do something. So to open up the show to a wider audience seems logical … until you think on it a bit. 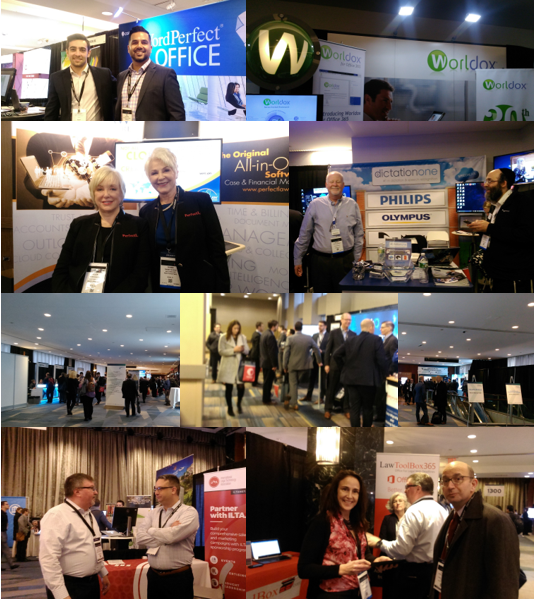 As the “largest legal technology trade show” that attracted 10,000+ legal professionals in its day, LegalTech NY already had the largest possible audience. You can’t cast a wider net than “legal” and “tech”. But here’s the kicker – now 2 years later, can you tell me what their larger audience is and how they are attracting them? Confusion No. 3 – Hashtag is what? After changing the name, ALM also tried to force the shifting of the hashtag associated with the event from #LTNY to #LegalWeek. Obviously, ALM does not understand that you can’t force anyone to anything on twitter and that “LegalWeek” is just too long for us old time tweeters more accustomed to the 140 character rule. Confusion No.4 – Why do I have to buy a ticket to an Expo Hall? The last drastic change put in place by ALM to create an event of broader audience appeal was the bright idea to charge an entry fee for the Expo Hall. Yep. Make people pay to be in front of people selling to them — that’ll make it more appealing! At $15 to $35 I want to say ALM is not trying to make another, albeit teeny, profit stream off their paid vendors. So then what’s with the charge? My guess would be ALM is purposely trying to limit the Expo Hall for paid attendees of the conference. My problem with that is that each company that exhibits pays ALM a hefty fee to do so. In a market as large as New York City, limiting vendor exposure by charging an Expo Hall entry fee doesn’t make sense to those showing and makes the event less exciting to those attending. Is it a quality over quantity debate? In some respects less is better. I am a bit of a germ-a-phobe and I do not like strangers touching me so there’s that. A few of the booth reps told me it makes the event less “hectic” for them. So less people = less hectic but also less connections and isn’t that what paying for company reps to be in front of people is all about? Anyway, it is obvious ALM is going to have to do something because most of the peeps I spoke with were disappointed (again) and a few (more) have vowed not to be back. As for my Expo Hall experience – with the exception of the Micro Focus game show (where I won a few Starbucks gift cards) and the awesome magician at the @doeLegal booth, I didn’t see much in the way of fun stuff, or entertainment, for those attending. 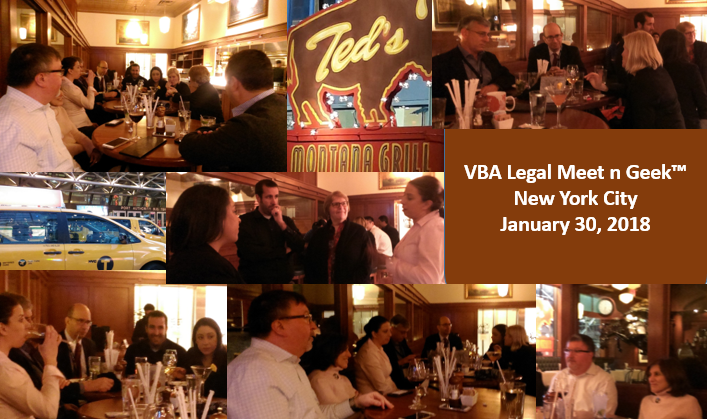 If you are a member of the Virtual Bar Association, look for Part 2 of my #LTNY18 experience, including photos of the people, food and reports from the social events in the February issue of the VBA Newsletter. 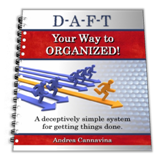 This entry was posted in Andrea C on February 8, 2018 by Andrea.